South of Brundidge on US Hwy 231 about 3 miles at Art Wurks. That of Wesley Snipes on the left, and that of The M.A.D. House Artists on the right. Those are Mom's and Mink's hands opening the crate as it was shipped to us from the Art Wurks Studio in Alabama. This is a photo of the front door of The M.A.D. 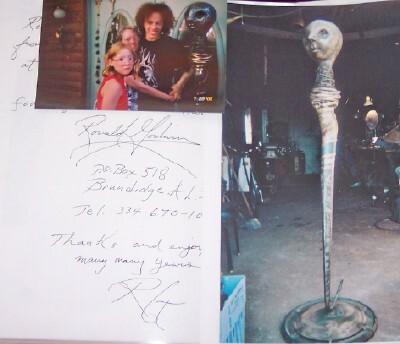 house Artists with Ronald Godwin's SNAKE CHARMER and his installed DOOR KNOCKER. Here is a picture of Mom and the kids after they unpacked Ronald Godwin's SNAKE CHARMER from the shipping crate. 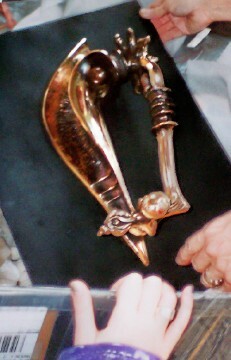 Ronald Godwin's SNAKE CHARMER up close and personal. Note the barbed wire necklace, the hammered copper strips, and the steel cable around his neck. 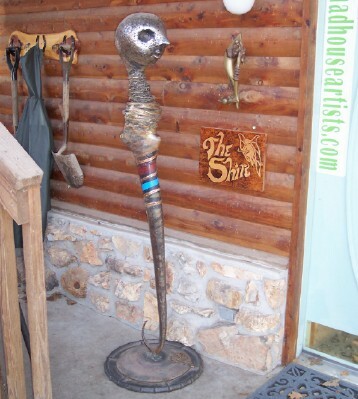 This Candle Stick was purchased from the ART WURKS Gallery in Brundidge, Alabama as we were traveling through some years ago. 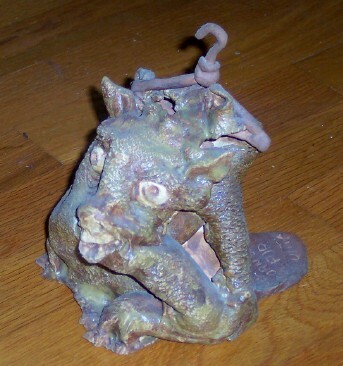 This is one of Ronald Godwin's Clay Sculptures. 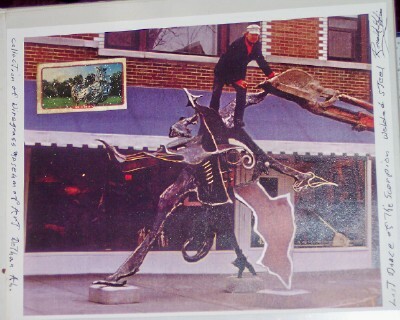 This is a photo sent by the artist, Ronald Godwin, of his huge 'Last Dance of the Scorpion' sculpture. The artist is standing on top of it. "The menacing, wrathful figure represents a natural world rising up in arms, a harbinger of the doom that awaits those who callously lay waste to the fragile planet. 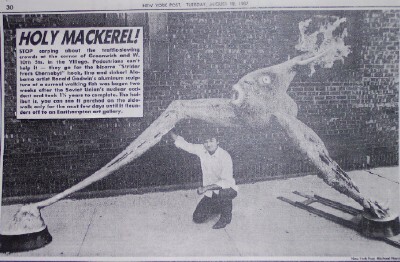 The arms and tails of this beast-like creature are poised to strike in any direction, yet hold in their protective embrace the images of the endangered bluebird, the sea urchin, and the ram." This is one of Larry Godwin's humorous and politically incorrect satirical pieces. This Beaver has already had the coat hanger installed for convenience, for, as the Beaver's inscription says, "What the hell, I was born to be a fur coat." 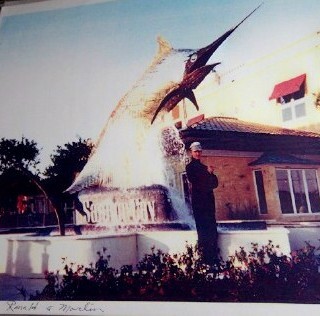 Larry also works in mammoth pieces that tower into the sky, like the MARLIN he and Ronald erected at SunRoc Cay in Orange Beach, Alabama. It was one of the few things left standing after hurricane season along the Gulf Coast. the Godwins made from Automobile bumpers. 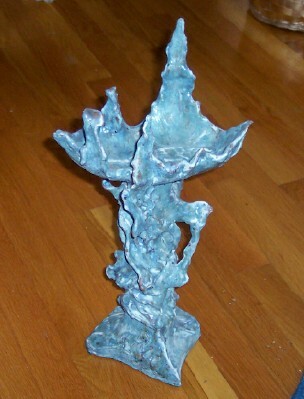 His materials are heavy bronze, steel, copper, aluminum, concrete. But the forms stretch upward, precisely balanced, appearing to be lighter than air. 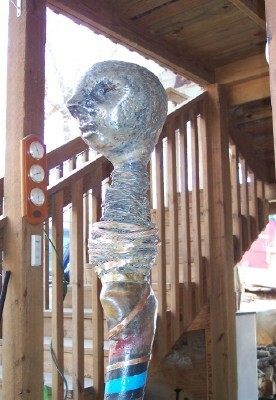 And water flows across many of the sculptures, so uninhibited that the water itself seems to dictate the form. Larry Godwin, born at the height of the Great Depression in rural South Alabama, has spent much of his life translating his aesthetic visions into environmental art and fountains. Public and privately held examples of his work dot the Southeast and other parts of the country and Europe. Larry received his initial arts training at Auburn University, graduating with a Bachelor of Applied Arts degree in 1957. After a stint in the Army, Larry opened a gallery in Brundidge, Alabama, eventually adding a full metal fabrication and foundry shop. After a tour of Europe, he completed his first large commission, a mural at the Gayle Planetarium in Montgomery, Alabama in 1967. A tendency toward relief elements in the artist's otherwise two-dimensional works led to medium and large-scale welded metal fully three-dimensional sculptures beginning in 1968. Larry Godwin was one of the first artists in the Artist-in-Residence program when it went national in 1970, teaching with great success in rural elementary, middle and high schools over two school years. He notably supervised the student construction of a school mascot (an eagle) from 1,400 pounds of chrome automobile bumpers from a local junkyard. 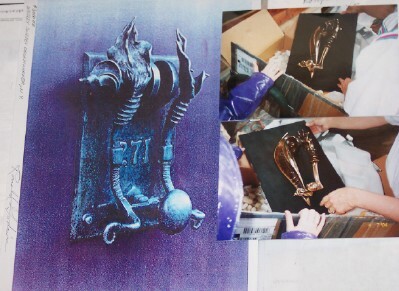 The sculptor's interest in fountain technology led to the first public fountain installations at a Montgomery mall in 1977 and an unpublished technical manuscript on fountain sculpture. A recent fountain grouping at Kindercare's home office in Montgomery celebrates the whimsy of childhood fantasies. Other notable monumental sculptures include work for Disney World, Alabama State University, and Hard Rock Café. A full-scale interpretation of the Wright Brother's 1910 flier at the Air Force's Air University in Montgomery in 1985 has led to other Wright fliers in Daytona Beach, Florida in 1989 (the 1903 "Kitty Hawk" model) and Dayton, Ohio, completed this year (the 1905 model). Larry frequently works with architects to incorporate sculpture into a building's ecology at the planning stage. He recently produced a series of seven bronze panels depicting in relief the history of Montgomery for a park in the Retirement Systems of Alabama complex. In addition to his Art Wurks gallery, Larry Godwin currently maintains a 10,000 square foot warehouse with overhead crane and other facilities for constructing and manipulating the monumental scale sculptures and fountains he favors. A foundry, lost wax casting center and other annexes bring the total workspace to 16,000 square feet. He continues to explore new forms, methods and materials such as sculptures that expand and contract or interlocking elements that combine in an infinite variety of ways.